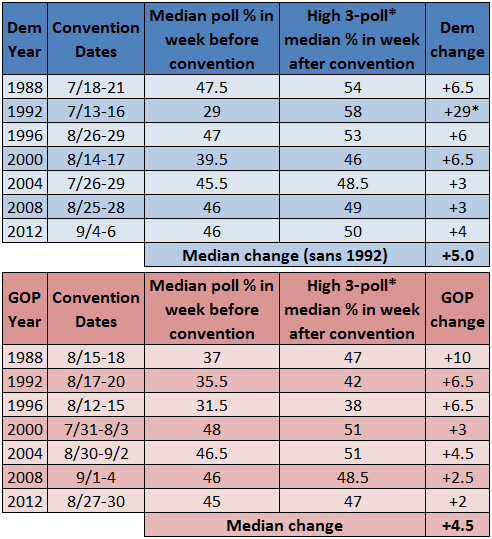 The convention bounce is a long-established pattern in presidential election cycles. Much has been written about it, so we won't rehash it too much. The main point is that conventions almost always generate an increase in a nominee's polling numbers during and after his or her convention, but often times the bounce is short-lived 1. Still, some of that jump in the polls can be maintained; in this environment, a poll bounce will probably signal increased party unity. This is what is important for Donald Trump and Hillary Clinton: The former needs to get his support among Republicans up to and beyond 90% in the polls (he's currently in the 80%-85% range) and the latter needs Sanders supporters, many of whom self-identify as independents, to more firmly back her (most surveys have shown a sizable chunk of Sanders voters still outside Clinton's camp). It should surprise no one if Trump gains in surveys following the Republican confab. In fact, as we said when reacting to Trump's choice 2 of Indiana Gov. Mike Pence as his running mate, it's quite possible that Trump will surpass Clinton in the poll averages. And Clinton will probably get her own bounce after her nomination is made official in Philadelphia. So what kind of bounce should we expect for Trump and Clinton? For two reasons, it's a fairly complicated question for Trump: First, the Democratic National Convention immediately follows the Republican National Convention, which may stifle Trump's uptick to some extent, as it may have hurt Mitt Romney's bounce in 2012. And second, Clinton is expected to announce her vice presidential selection on Friday or Saturday, a very obvious attempt to eat into Trump and the GOP's news cycle. But we can look back at recent cycles to at least get some idea of what's been a “typical” bounce. The Crystal Ball has collected polls before and after conventions in elections from 1988 to 2012 to examine this question. We included any survey that was taken with at least one day inside of the week before or after the convention (e.g. if a convention began Aug. 14, a survey taken through Aug. 7 was included). To get a general picture of the polling situation prior to the convention, we found the median poll percentage for a candidate from the included surveys. Then, to see what the maximum bounce was for a candidate, we took the median survey figure for three-or-more poll samples in the week immediately following the final day of the convention. See the Table 1 notes for further information on the methods used. Prior to 1988, there was difficulty finding enough polling data that met the timing criteria, so that's why we stuck with the 1988 to 2012 timetable. The reason for looking at the median result rather than the average was to reduce the impact of outliers in small-sized samples while trying to isolate the timing of the bounce. This is surely an imperfect exercise because of the variability in polling, but nonetheless it's another way to look at this phenomenon. Notes: If there were three or more polls on a single day, the median for that group of polls was a data point. If there were fewer than three polls in a single day, the data point was based on the most recent set of three or more polls up to the latest day surveyed (e.g. the median result for one poll ending on Aug. 18, one poll ending on Aug. 19, and two polls ending on Aug. 20 would form a data point for Aug. 20). *Clinton's 1992 post-convention high is disproportionately large because Ross Perot momentarily withdrew from the race on July 16, making it a two-candidate race until Perot re-entered at the start of October. Overall, the data show that all candidates have received at least some bounce. The largest median bounce in the 1988-2012 period was technically Bill Clinton's 1992 jump in the polls, but that was mostly a result of Ross Perot's exit from the race 4 on July 16, the final day of that year's DNC. Outside of that understandable outlier, the next-highest median bounce was George H.W. Bush's 10-point increase in 1988, which helped him catch up to Michael Dukakis, who had led him for months. On the low end, Romney's median poll increased just two percentage points from its pre-convention position. As referred to above, that year's RNC was immediately followed by the DNC, just as it is this cycle. That factor, plus a bizarre Clint Eastwood speech involving an empty chair that completely overshadowed the nominee's speech, may have contributed to a less-than-stellar rise in the polls. The median change for both parties over the 1988-2012 is relatively similar: 5.0 for the Democrats (not including the unusual 1992 case) and 4.5 for the GOP. However, there does seem to have been a smaller bounce in recent times compared to earlier in the 24-year period. This trend may well be meaningless, or it might be connected to the increased polarization of American politics that has left more voters already firmly entrenched in their party's camp earlier on. That hypothesis may be tested this year considering the relatively low combined percentage (84%-85%) held by Clinton and Trump in the polling averages, which means that they may have more room to grow. More often than not, the highest median poll bounce has appeared in the first day or two of three-poll samples. Of course, this makes intuitive sense if polling bounces tend to fade at least to some degree, but it's also true when we particularly isolate data down to a one- or two-day median, as in most data points in this set. For Trump, the pre-convention poll median pegged him at 41% of the vote. If he were to get the median Republican bounce seen in the past seven cycles, it would push him up to 45.5%. Depending on the polling average, Trump's post-primary high has been 42%-43%, so a jump to 45% or so would represent a new high for the now-official GOP nominee. At the same time, Trump could potentially suffer from the same problem as Romney due to the back-to-back nature of the party conventions. If that happens, we would expect his ballooning poll numbers to quickly dissipate after the initial round of post-convention surveys are released. The size of Trump's poll bounce -- and Clinton's -- will be an important factor in measuring the success of the conventions.